Pentland Hills, general view, showing Logan Burn and Black Hill. Oblique aerial photograph taken facing north-east. This image has been produced from a print. One unroofed building annotated Ruin with two lengths of wall marked by pecked lines attached to it, and an enclosure, also marked by pecked lines and lying on the opposite bank of the Logan Burn, are depicted on the 1st edition of the OS 6-inch map (Edinburghshire 1853, sheet 11), but they are not shown on the current edition of the OS 1:10000 map (1989). Information from RCAHMS (SAH) 9 October 2000. The site was visited and a field sketch made by members of Midlothian Field Group (Robin Callendar and Geoff Waters) on 12 October 1980. 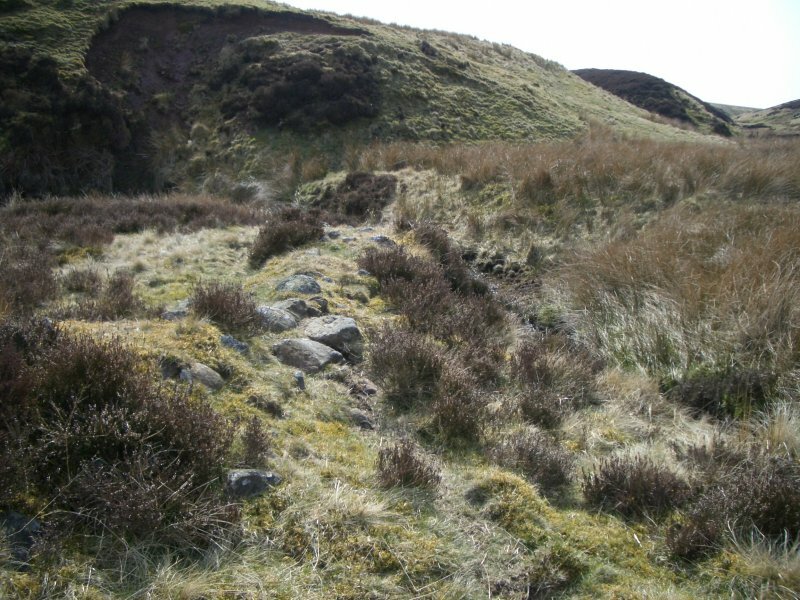 It was re-surveyed by members of Edinburgh Field Archaeology Society on behalf of the Pentland Hills SRP group between March 2007 and February 2011. Historical research was undertaken in the NAS , June 2010 - February 2011. 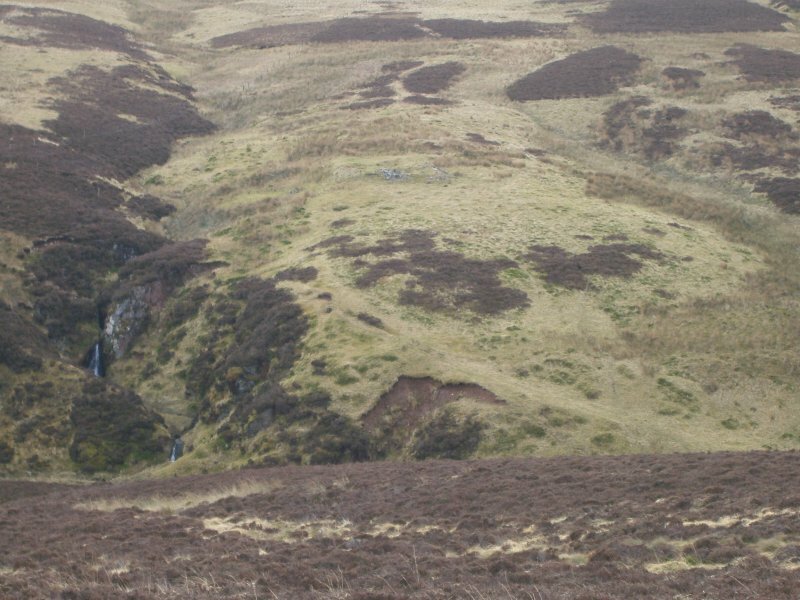 This site comprises a small dry-stone building set within a large rectangular enclosure on top of a steep cliff above a waterfall on the S bank of the Logan Burn on the N edge of a terrace that extends from the S side of the Logan Burn to the base of the W and E Kip hills. 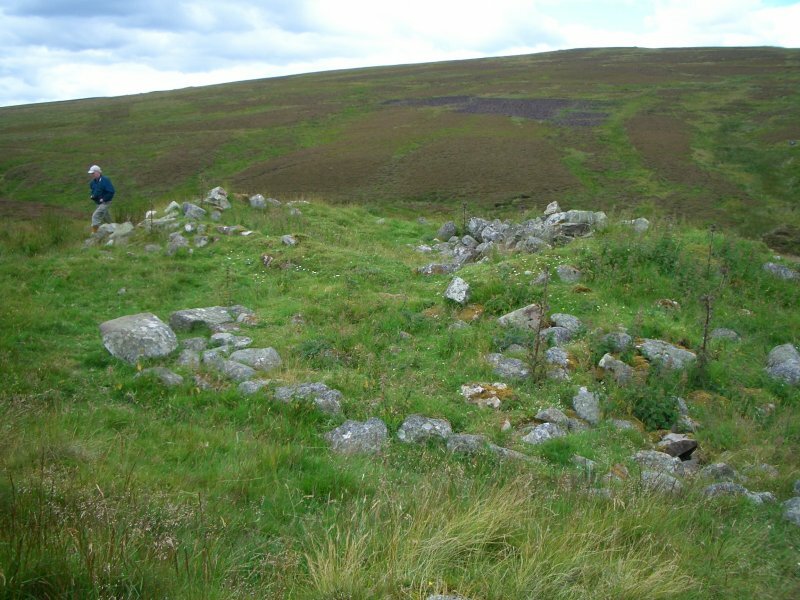 At the foot of the cliff, c100m N of the building, is an oval enclosure built upon an ox-bow loop of land on the N bank of the burn. The enclosure is accessed by a track which runs diagonally down the steep escarpment from the NE, entering it on its N side across a substantial stone built ramp that appears to have impeded the flow of the burn. The building, a dwelling, is aligned NNE – SSW and measures c9m x c5.50m across walls c0.75m wide, which stand 0.5m-1m high. There is an entrance in the SSE wall and an out-shot, c3m x c5.5m, is attached to the E end wall. The footings of a rectangular structure, c5m x c2.5m, possibly a terrace, small enclosure or later building, are situated in front of the building, abutting its front (SSE) wall. Low turf banks extend for c6m in a S direction from the SW and SE corners of the main building, to join low grass covered stone banks which form a larger square enclosure, possibly a garden plot, around the N, E and W sides of the building. The oval enclosure below the building measures c25m c x 21m E-W and is enclosed by a low stone wall 1m thick. The wall is low and denuded to the SE but the inner face in the NW arc stands about 0.5m high while the outer face extends down to the water level and stands about 1.5m high. 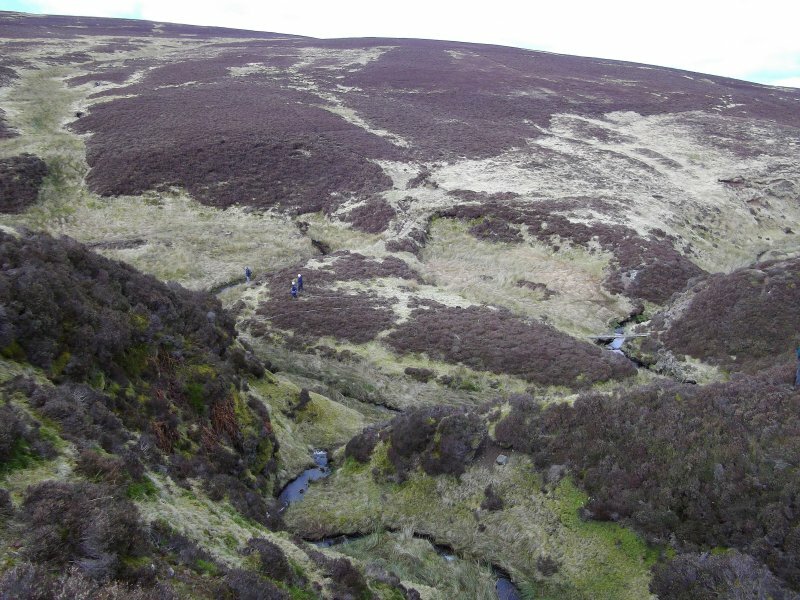 Although very low-lying the interior of the enclosure is raised sufficiently above the water level to remain dry as evidenced by a good covering of heather. The site is very sheltered but difficult access down the steep cliff from the building suggests it is unlikely to have been a garden plot since there is sufficient good quality soil on the upper terrace for this. It seems too close to the water to have been a habitation site and is most likely to be a stock enclosure of some kind, although there is insufficient rubble to suggest the stone walls stood much higher than they are at present. 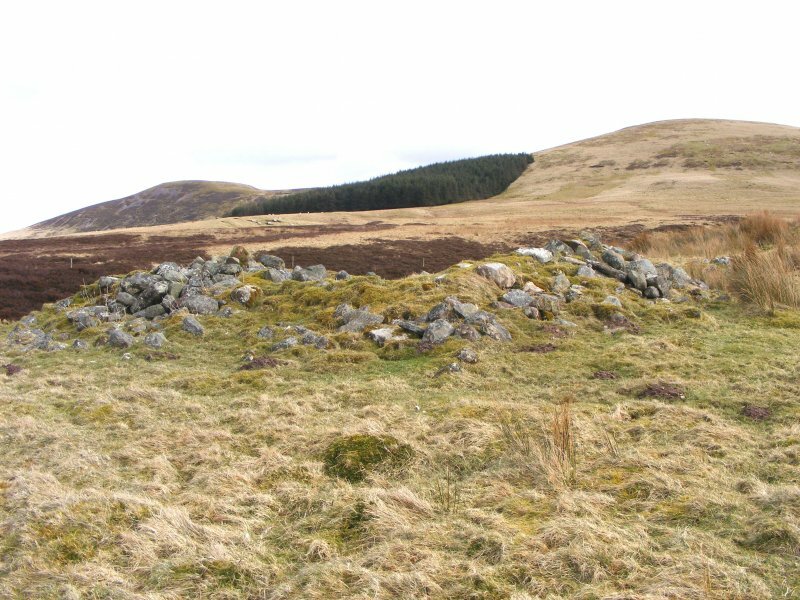 The visible remains are flat topped and substantially built and could have formed the foundation walls for a temporary fenced or turf enclosure perhaps used as an gathering pen either for cattle or for sheep shearing and wool washing. Map evidence suggests that this is the site of Hare Hill House, probably a shepherd’s dwelling built between about 1801 and 1812 and deserted some time between 1828 and 1853. The building is not depicted on an 1801 (updated 1840) plan of the Logan estate (RHP 13489/1-2) so was either built after that date or thought too insignificant to include. It is shown unnamed on Knox’s ‘County Map of the shire of Edinburgh’(1812-16) and Thomson’s county map of 1820, but appears as ‘Harehill’ on Sharp, Greenwood & Fowler’s map of the ‘County of Edinburgh’ (1828) with a path leading to it from the base of the West Kip. 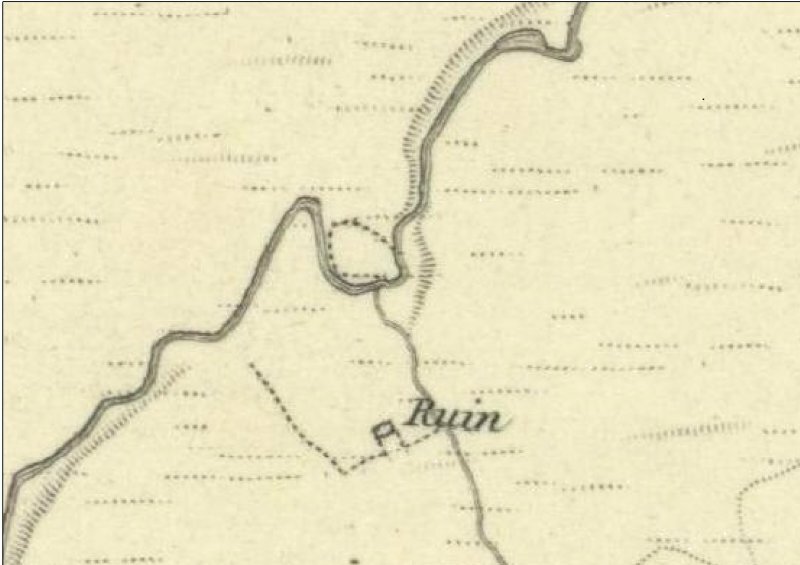 The 1st Edition of the Ordnance Survey 6-inch map (Edinburghshire 1853, sheet 11) shows an unnamed ruin which the associated Name Book (p30) describes as “the ruin of Hare Hill House situated on Eastside farm near the south base of Hare Hill”. The Name Book Collector’s Nameslist (no.136) calls it “a cot house” listing the authorities as James Noble, shepherd of Loganlee and Mr Symmington, farmer of Eastside. 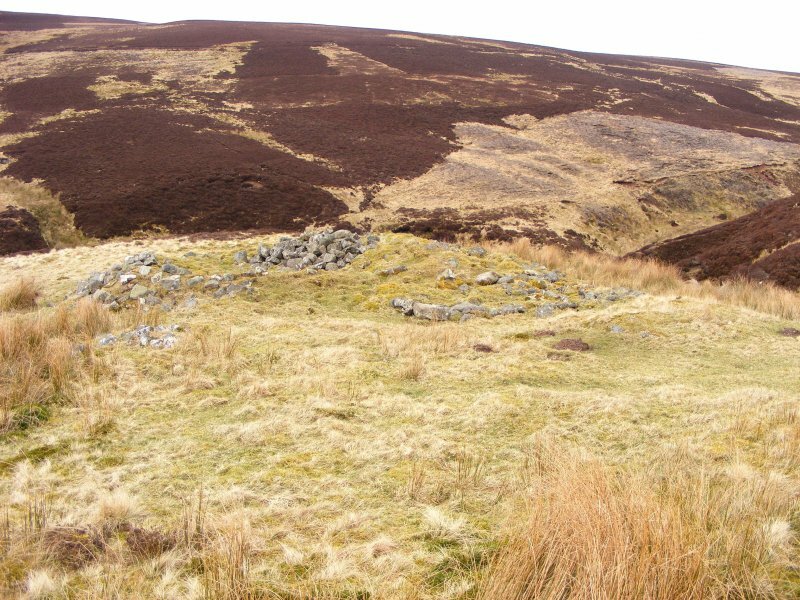 It is one of several small isolated buildings in the Pentland Hills identified as cot houses in the OS Name Book. 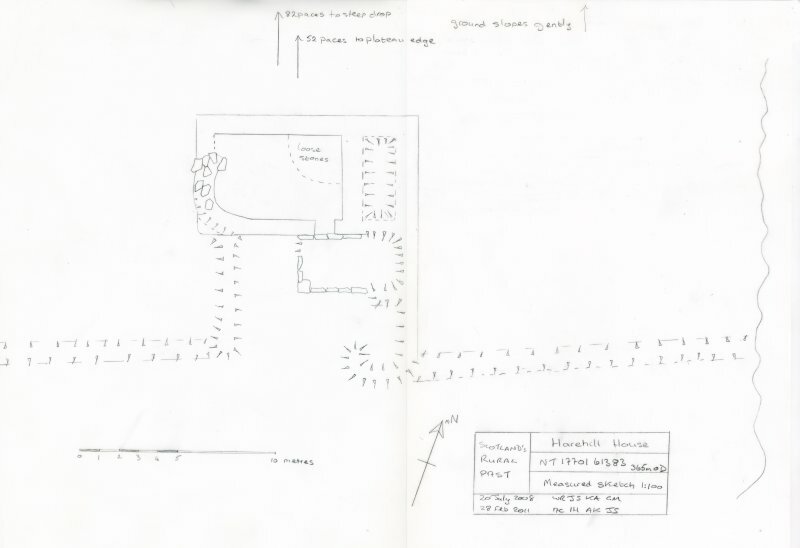 Descriptions of cottar dwellings are given by George Robertson in his “Rural Recollections on the Progress of Improvements in Agriculture and Rural Affairs” (1829, p.78ff) and sites at Fala Knowe NT 2138 6160 and Grain Burn NT26SW 46 on the Logan Estate which are associated with small scale cultivation may represent a similar type of holding. Neither site is recorded in the OS Name Book so they must have fallen out of use before it was compiled. 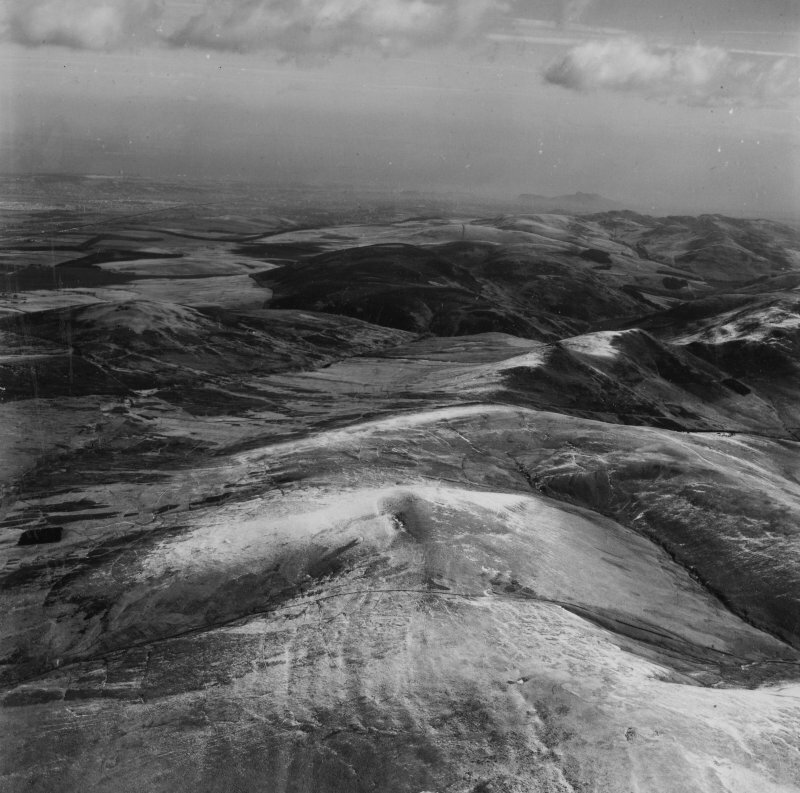 However, as the Logan Estate appears to have been largely unaffected by 18th century agricultural Improvements evidenced elsewhere in the Pentland range, its landscape is likely to retain evidence of earlier farming activities and certainly the remains of enclosures and turf stells are visible in an RCAHMS aerial photograph of the terrace area (AP FA42 58/RAF/3544 no.0102 – pers. comm. Geoff Waters, Midlothian Field Group). It may also be relevant that the landowner of the Logan Estate Sir John Gibson was fined £50 sterling in 1676 “for Field Conventicles kept on lands of Pentlands” (GD495/35 Steuart Notes for a History of Colinton – box of papers). The site, especially the oval enclosure, is secluded but has good access and escape routes in all directions so it could also have functioned as a Covenanters meeting place.